For me, one of the more interesting sessions at the recent IETF 81 meeting in July was the first meeting of the recently established Homenet Working Group. What’s so interesting about networking the home? Well, if you regard challenges as “interesting”, then just about everything is interesting when you look at networking in the home! It’s been a very long time since the state-of-the-art in home Internet was plugging the serial port of the PC into the dialup modem. Even the ADSL modem, even when combined with some for of WiFi base station, is looking distinctly passé these days. Today the home network is seeing the intersection of a whole set of interests, including the phone service, the TV service, home security services, energy management, utility service metering, possibly other forms of home device monitoring, and, oh yes, connecting the laptops and the mobile devices to the net. And of course it’s not just a home LAN over a wired network. WiFi home networks are commonplace, and of course there are various Bluetooth devices. Maybe sometime soon it will be common for the home network to also host some form of 3G femtocell as well. But these days even that level of network complexity is not enough. Juniper Networks and Telecom Italia today announced that they received Global Telecoms Business’ IP Transformation award for their IPv4 Depletion & IPv6 Migration joint project. The project was designed to manage the parallel tracks of IPv4 and IPv6 seamlessly within a single architecture. The award was presented at the recent Global Telecoms Business (GTB) Innovation awards ceremony in London. The active measurements the RIPE NCC carried out on World IPv6 Day on 8 June 2011 included ICMP (Internet Control Message Protocol) and ICMP6 (ICMP for IPv6) measurements from our vantage points to selected hostnames of World IPv6 Day participants and other dual-stacked parties. We used these measurements to determine the performance of IPv4 versus IPv6 connections. The figure below shows a histogram of all relative IPv4 versus IPv6 performance data points collected during World IPv6 Day. A single data point consists of the ratio of IPv4 and IPv6 performance from a single vantage point to a single destination during a 10-minute interval. The image shows that while this distribution has a bell shape, it is a little “fatter” on the IPv4 side. This means that IPv4 is faster more often than IPv6. What this tells us is that you are slightly better off in an IPv4-only environment than in an IPv6-only environment. On a dual-stack client that unconditionally prefers IPv6 to IPv4, IPv4 is more often the faster protocol, but this is far from a universal truth. There is also a significant chance that IPv6 is faster, since the “IPv6-is-faster” part of the histogram also has a significant volume. Note that we measured ICMP and ICMP6, and not HTTP performance. Also, the IPv4 and IPv6 end points for a given hostname may be topologically and/or geographically in (very) different places, especially when proxies are used for IPv6 to IPv4 translation. In cases where the IPv4 and IPv6 destination end points are not at the same location, the distance between a vantage point and either the IPv4 or IPv6 destination end point has a large influence on the measured performance. In conclusion, we can say that comparable IPv4 and IPv6 performance can be seen as an indication of a mature deployment of both IPv4 and IPv6 in a network. In the data we analysed, we see that IPv4 is still generally faster then IPv6, but for a significant fraction of measurements IPv6 is the faster protocol. 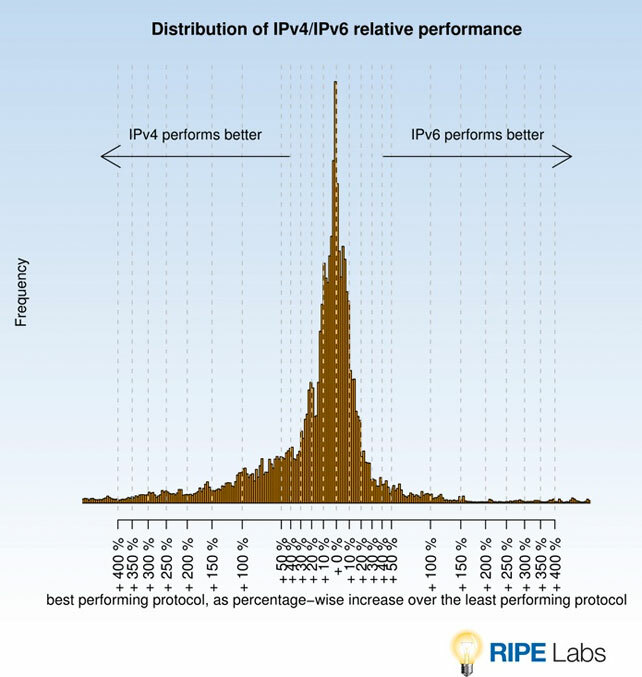 For more detailed information, please refer to the background article on RIPE Labs: Measuring World IPv6 Day — Comparing IPv4 and IPv6 Performance. “Though the industry has been talking about IPv6 for over a decade, it’s finally enjoying a quiet evolution, with 83% of the service providers we interviewed already deploying IPv6 or planning to by next year, and all have plans of migrating. With IPv4 addresses running out in some places in the world by 2012, and as many as 15 billion machine-to-machine (M2M) devices expected to be connected to the Internet by 2015, each needing its own IP address, IPv6 migration has become a front-and-center issue for carriers,” notes Michael Howard, principal analyst and co-founder of Infonetics Research. Complete info at FierceTelecom, Virtual-Strategy and TMCnet. Ziggo is enkele jaren geleden al gestart met het geschikt maken van haar netwerk voor IPv6. Uitgangspunt hierbij is dat Ziggo’s klanten nu en in de toekomst gewoon gebruik kunnen blijven maken van het Internet en helemaal niets merken van de omschakeling naar het nieuwe protocol. Naar verwachting ondersteunt Ziggo medio 2012 het IPv6 protocol voor haar klanten.